This weekend we celebrated the Chinese New Year, which coincidentally was the inspiration for our newly launched collection ‘Leo De Janeiro’. To kick start the New Year and this new blog, here we reveal a little more behind the story, inspiration and design concepts of our January Collections. Leo de Janeiro is the latest collection by Jim Thompson, inspired by the dancing lions found at Chinese New Year street parades. This iconic Lion figure can be found in the lead design, frolicking playfully amongst colourful foliage and tropical wildlife. Jim Thompson’s Creative Director Ou Baholyodhin still looks to the company’s founder when seeking out inspiration for these types of designs. In a recent interview with the Bangkok Post, he spoke more on this, saying: “[w]henever we need inspiration for a new collection, we always go back to our roots, asking questions like, 'What would Jim Thompson do? [….] He loved Thai art and culture as well as our festivals.” With the launch of this year’s collection falling in January, ‘we thought of the Chinese New Year and the lion dance’, Ou adds. 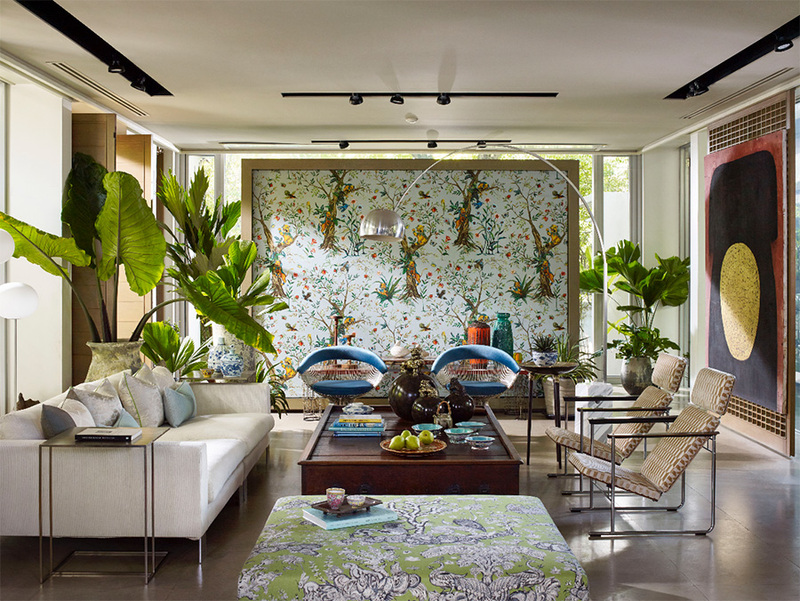 Other references to Mr Jim Thompson include Heliconia Dreamin’, an embroidered floral design inspired by a walk around Jim’s garden at his historic former home in Bangkok. The house also provides inspiration through Bamboo Bar, a simple trellis design created based on the bamboo furniture found in Jim’s living room. Lastly Ming Ming’s oriental and regal decoration, jacquard woven onto silk, mirrors the intricate motifs often found on traditional Asian ceramics. This reference came from the similar designs on Jim Thompson’s very own extensive collection of Chinese ceramics, still exhibited at the Jim Thompson House today. In addition to the bold designs there are some simpler patterns, Cala for example, is a cotton and linen contemporary update of the classic silk moire, while Play Misty offers a soft ombre effect to create a mysterious atmosphere. This January collection kept our team particularly busy as it also marked the first year that Ou designed an outdoor collection, entitled Negresco. Inspired by the cosmopolitan lifestyle of the French Riviera, the collection takes its name from the resplendent Hotel Negresco in Nice France, where influential writers and celebrities have flocked to since the 1920’s. Camargue, (named after another exclusive destination), an outdoor velvet made from state of the art Dralon acrylic yarn, is undoubtedly a highlight, suggesting that outdoor interiors should not be inferior nor compensate on quality or luxury. The joys of travel are a key source of inspiration for this collection, channelling exotic colour, the tropics and a coveted vacationing lifestyle to create sturdy dual-purpose fabrics. Both Leo de Janeiro and Negresco are now available at our showrooms and at our trader’s showrooms around the world. Find a list of our international stockists here. For more on the story and a look at the individual fabrics featured in the January Collections, browse our brochure online here. And to read more on Bangkok Post’s breakdown of the January Collection visit their site here. Here we will share what we’ve been up to, design insights, sneak previews of our new collections; as well as industry news and design inspiration. Jim Thompson is a leading manufacturer in Thai silk but also produces an array of luxury fabrics made from a wide selection of high-quality fibres. Today, these designs can be found adorning the walls and furniture of some of the top hotels, private residences, luxury retailers, as well as private yachts and planes all over the world. 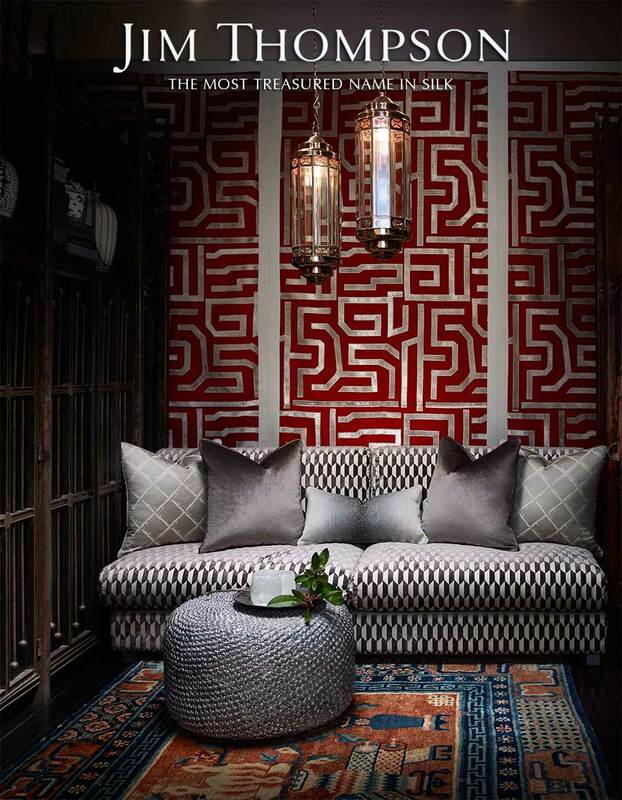 Just browse our Instagram and Facebook page and you’ll find a plethora of stunning design projects featuring Jim Thompson fabrics, used for a myriad of environments and applications. Jim Thompson fabrics can also be found on theglossy pages of distinguished interior magazines, including the likes of World of Interiors, Homes and Gardens UK and Elle Decoration. 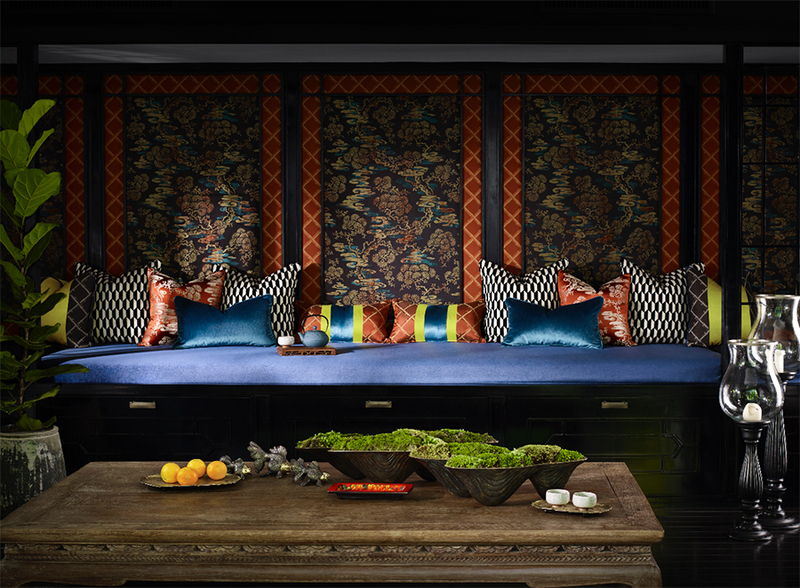 Jim Thompson has been creating coveted textiles for over fifty years, since thecompany’s founder, American James H. W. Thompson, known affectionately as Jim, first arrived in Thailand in 1945. Mr Jim Thompson quickly became enamoured by the country and inspired by the beautiful silk fabrics woven by local artisans. From here he went on to create beautiful collections of silk, achieving real notoriety when he was noticed by the editor-in-chief of US Vogue, and when Irene Sharaff used Jim Thomason fabrics in her costumes for the iconic King & I Broadway show. 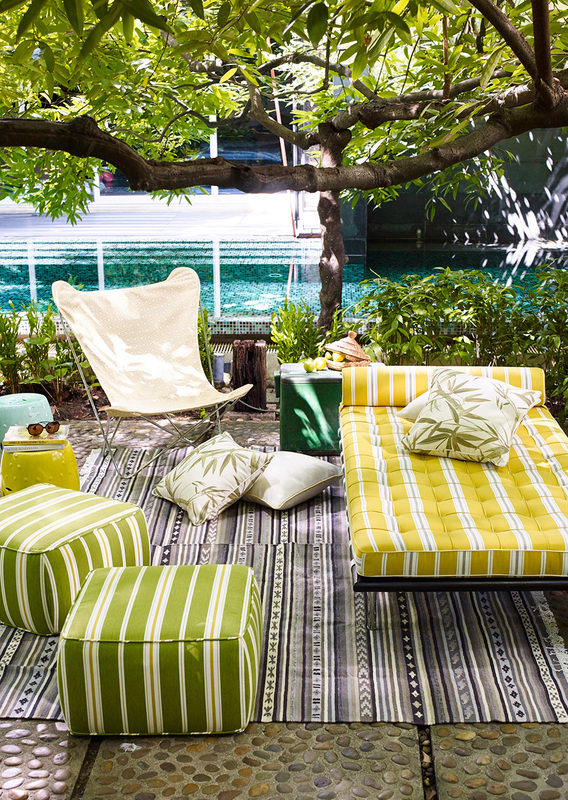 As a brand today, Jim Thompson continues it’s founders legacy, producing two inspiring collections annually. For those of you who want to discover more about the brand’s fascinating founder and his eventful life, we have written all about him here. And to discover more from out latest collections, explore the products section of our website here. Lastly, if there is anything in particular that you would like to read about, please drop us a message or comment via one of our social media channels. We’d love to hear from you.